Red Box International consists of a network of specialist engineering companies working together to produce innovation in design and excellence in production. They specialise in metal working and welding, and portable and fixed power solutions for the aerospace, military, marine and automotive industries. 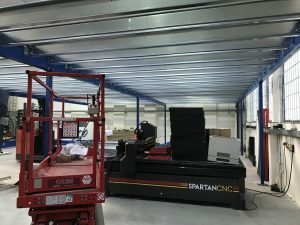 Red Box moved into their new facilities and have grown due to the success in demand for their products & services and contacted HMF to evaluate how additional space could be created for storage and manufacturing. After carrying out a site survey HMF provided an AutoCAD design plan showing a proposed mezzanine steel work arrangement where mezzanine columns were located and associated 1 hour fire resisting provided. HMF liaised with Red Box to further refine the design which incorporated the need for building regulations approval. 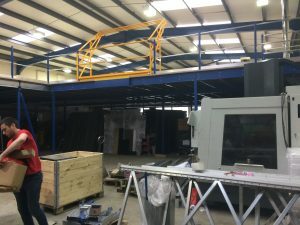 HMF were then instructed to carry out the works which included 2 new mezzanine floors complete with special low profile telescopic safety gates allowing 2.4m wide x 1.2m deep pallets to be loaded up onto both mezzanine floors. 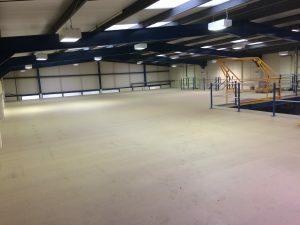 HMF as main contractor also carried out modifications to the existing building including fitting out new offices on an existing mezzanine floor. Other works carried out on the project by HMF included builders work to facilitate new doorways through blockwork/partitioning walls with new fire resisting doors, decoration and flooring works. The works were completed in a fast track 8 week programme in a phased operation. The works were completed on programme and Red Box are now using the new space provided by HMF most productively.